Duzce Medical Journal (Duzce Med J) is a peer-reviewed open-access periodical journal based on independent and unbiased double-blinded peer-reviewed principles, published three times a year, in April, August and December by the Duzce University Medical Faculty. Began its publication life in 1999, and all of its issues have been available electronically since 2005. Publication languages of the journal are Turkish and English. The articles submitted are required to be unpublished and are not under review for publication elsewhere. The authors are responsible for their article. No submission, processing or publication charge is required from the authors. In all fields of general medicine, editorial comment/discussion, invited review, original research, case report, letters to the editor, and surgical technique studies in the basic and clinical sciences are evaluated for publishing. Duzce Medical Journal is in conformity with the criteria of International Committee of Medical Journal Editors (ICMJE), the World Association of Medical Editors (WAME) and the Committee of Publication Ethics (COPE). All articles published in Duzce Medical Journal (e-ISSN: 1307-671X) which has adopted the open access policy, are available online without any fee request. Users are allowed to read, download, copy, distribute, print, browse, and link to all articles without prior permission from the author and publisher of the journal. 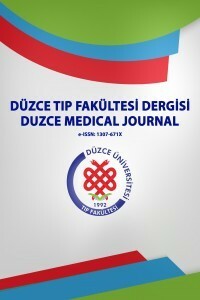 Duzce Medical Journal is licensed under a Creative Commons Attribution-NonCommercial-NoDerivatives 4.0 International License.